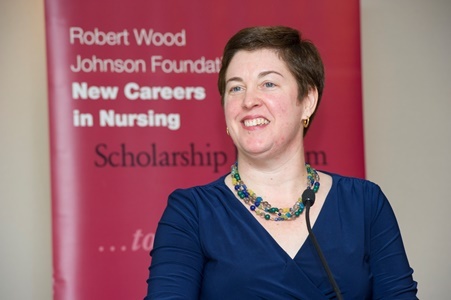 The New Careers in Nursing (NCIN) data set, a Robert Wood Johnson Foundation funded initiative, followed over 3,500 students in accelerated nursing programs in 130 programs/institutions across the United States. Many of the students completed an entry, middle and exit survey asking questions about their career interest, academic support, barriers to completion, borrowing patterns and initial job placement. There are over 400 variables with standard demographic data such as race/ethnicity, gender, socioeconomic status and primary language. Below are just a few ideas grouped by studies about the individuals, the programs and for state and federal policies. For a few questions, descriptive results are presented to further nurture research thought. At the close of the NCIN program the National Program Office (NPO) developed two data sets to help nursing education researchers and policy makers gain a better understanding of the impact of NCIN accelerated nursing programs. These two data sets are described below with their possible uses. Following each description, the data file is available in Excel format and includes file notes and additional variable descriptions and analysis purposes. This data set contains all 130 participating NCIN programs in 41 states including the District of Columbia. It provides a general understanding of accelerated nursing education programs, the type of degrees awarded (Bachelors, Masters or combined), amount of grant funding over the life of the NCIN program, time to program completion and the number of scholars who participated and completed each program. It also includes if the educational model was combined with traditional nursing program and three measures of the IPEDs Carnegie Classification of each nursing school. This data set is best suited for comparative program analysis especially for school level administrators who are interested in beginning or expanding an accelerated nursing program. This data set includes over 3,500 records of the scholar participants in the NCIN program. The file has been cleansed of personal information to maintain the privacy of the scholars. It includes key demographic information and responses to three program surveys given at the beginning, middle and six months following completion of the accelerated nursing program. The survey questions tracked responses to pre-entry program support, confidence in nursing skill acquisition, mentoring experiences, leadership and careers aspirations. It also includes experiences with the culture and climate of the nursing program, educational indebtedness, NCLEX passage and first position attained after program completion. This data set is best suited for analysis of the individuals who participated and completed the NCIN sponsored programs. While institutions have been masked to protect individuals, the data can be aggregated to the regional level to give an approximation of the recruitment type of aspiring and successful applicants to nursing programs. It also can answer questions about program supports that enhance and promote accelerated degree completion. In early September 2016, NCIN's Program Office released a call for research application proposals to utilize a data set collected over the eight years the program existed. That data includes responses from more than 3,500 scholars to annual progress surveys with nearly 400 variables. It is an extremely valuable resource for the nursing education community and the most complete data set for accelerated nursing students, and specifically students who are underrepresented in nursing. The response was overwhelming; more than 40 competitive submissions were received. After weeks of thoughtful review and consideration, we are thrilled to announce the four grant winners. Each grant recipient was awarded $3,000 to support their research projects. As a part of their grant, winners must also seek publication of their studies in a peer-reviewed journal. Describe potential use of a secondary database that is being archived by the Robert Wood Johnson Foundation.